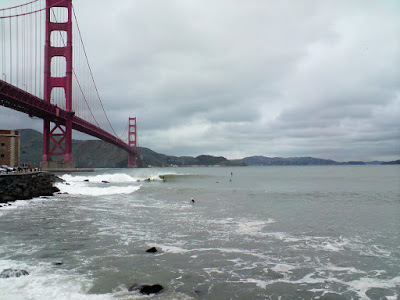 Stand Up Paddling Fort Point in San Francisco: These shots were sent to me by a friend in the city. 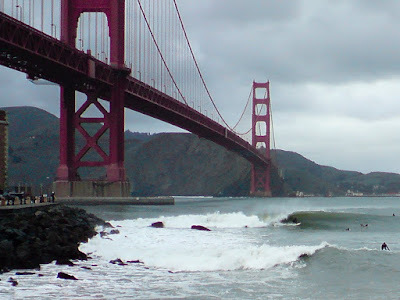 Photo: Yep, that's the Golden Gate in the background. Photo: I hope the stand up paddlers were acting reasonably, it looks like one of them may have shoulder hopped a prone guy. Photo: It's good practice to consider that your actions as a stand up paddler affect all who come after you- don't ruin it for the rest of us! Great pic's and vid of mex's it almost drove me off the edge. This goes to show there's a lot of left in San Francisco? PS new stamps four footer i got at xmas time is on fire. yep- I'll vouch for that... you were ripping on that 4 footer! I got a new 9'1 coming that's going to blow minds!!!! Doesn't picture 2 show the SUPer has dropped in someone? Looks like it to me... that's why I wrote the caption the way that I did. 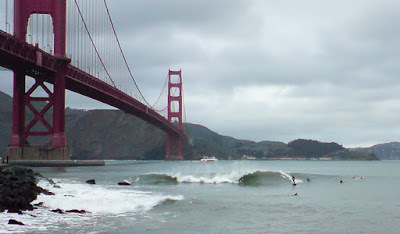 What happens at Fort Point is that a SUPer can catch a wave a lot earlier than the surfers that are always on the inside. I've noticed that the SUPers are considerate enough to keep to the left and wait for the outside to break. What is see is that surfers are dropping in on a SUPer that has been on the wave for a few seconds already. What is the rule? First on the wave or inside man gets the wave? If I'm sitting way outside and a guy drops in on me as I'm surfing a wave through- truthfully, I don't really care. The rule for me has always been that the guy closest to the peak has right of way. But the thing here is don't be a jerk and continually paddle up, past everyone, to the peak. Take turns and even better- when it gets crowded, surf somewhere else. Crowded spots like Ft. Point are tough- I try to avoid waves that have one distinct take off spot- too much tension to introduce a stando into. Is it still soaking wet? Beat the rainy day blues... a couple more snaps. Is it coming down yet? More RambleWriter stuff: Check out the truck! Super fun day... so tired.